Panoramic cameras are interesting because they can record in ways that other cameras cannot. The Pilot Era is a professional level panoramic camera from Pisoftware. They estimate it will be priced at approximately $3,000 after it becomes available. Don spoke with Adler and William from Pisoftware. 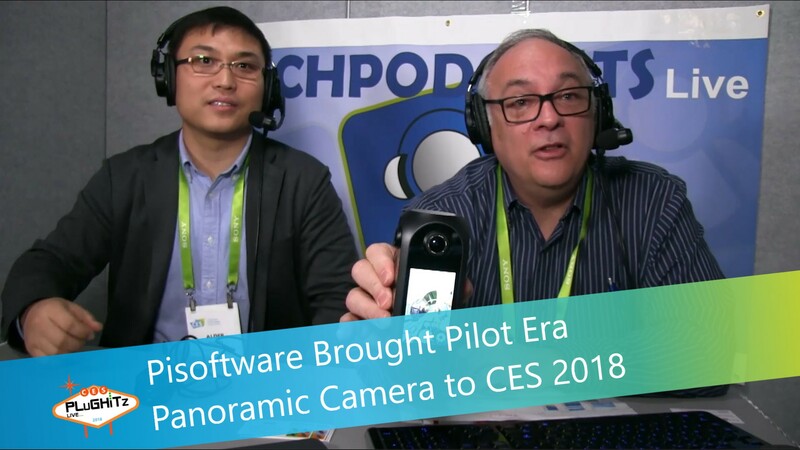 They discussed the Pilot Era panoramic camera. The device they brought to CES 2018 was a prototype. Those who are interested can request a trial of Pilot Era. There is potential you will be selected to test the Pilot Era panoramic camera. The Pilot Era can provide 8K panoramic video and image, at a quality that works quite well with VR goggles. It is an all-in-one machine. You don't need a PC to do the post-staging of your video. Instead, you can interact directly with the camera through the screen. Your video finishes inside the camera. There are four cameras on the device, one on each side. The lenses are slightly tilted up so they can see what is above them, allowing the lenses to stay in focus. The Pilot Era does real time live streaming with 4K or 6K stitching.